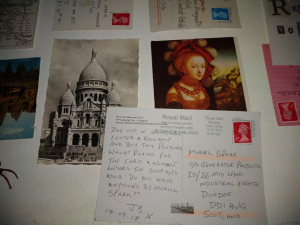 Entering the space at GENERATOR to explore Michael Curran’s new exhibition on Muriel Spark, The Public Image (Scottish Lady Tiger), one notices how large the gallery feels, with empty spaces between each exhibit. In fact, the Generator Chairperson and curator of the exhibition, Hari MacMillan, explained that the space had been designed deliberately to echo two apartments from Rome: the apartment in which much of the action of Muriel Spark’s novel The Public Image (1968) – from which the exhibition takes its name – takes place, and Spark’s flat in Palazzo Taverna – a grand space, but one which Spark never fully furnished. 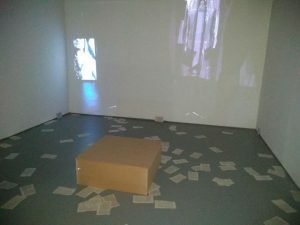 This spatial echo is important to mention because it speaks to how the exhibition at GENERATOR aims to show Spark’s life, not in a dry, detached biographical fashion but instead seeks to capture the atmosphere of the spaces and lives she inhabited; the multiplicity of meanings behind many of the gallery displays themselves reflect multiple selves and public image(s). The exhibition’s collaborative efforts are evident in the wide and creative range of displays: in one corner, a screen on a vertical slant shows a recorded tour of Spark’s Rome, filmed by Francesca Vincarelli; in another sits a prototype of the perfume “POETA”, by Rebecca Sharp and Valerie Sutton, the final version of which is be launched on Sunday 30th September at the finishing party. 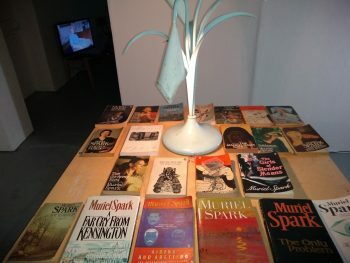 Between these collaborative commissions and a table stacked with all 22 of Spark’s novels, which visitors are welcome to read, the exhibition invites not just Curran, but everyone, to celebrate Muriel Spark. 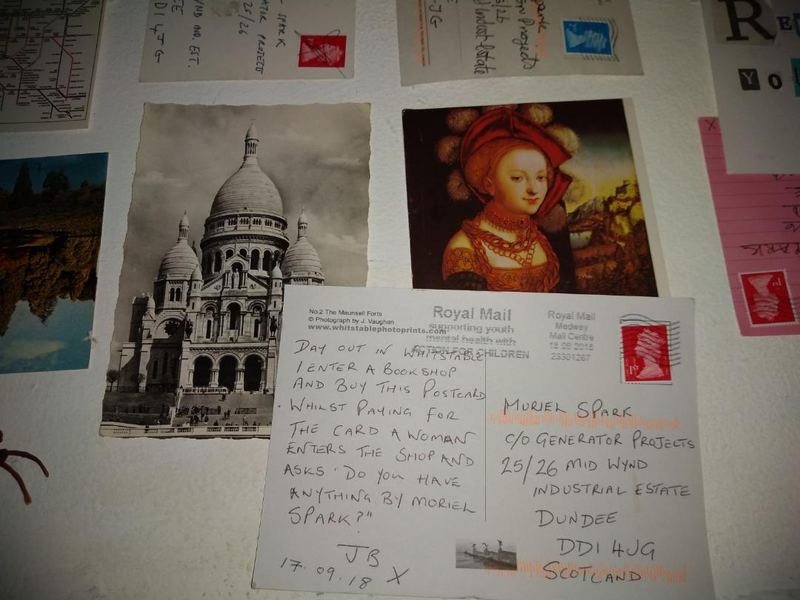 It’s clear the exhibition comes from a place of knowledge of, engagement with as well as great passion for, the life and work of Muriel Spark. 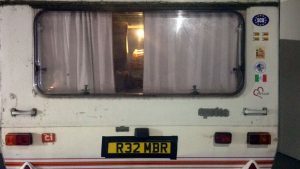 However, for an exhibition concerned with celebrity and image, especially false public images, self-awareness is important when trying to capture the essence or “atmosphere” of an artist. Curran’s reflexivity is apparent in our exchanges; he referred to Spark as a “chameleon”, and remarked, “I think [Muriel Spark] would’ve liked this. She would’ve found it funny”. 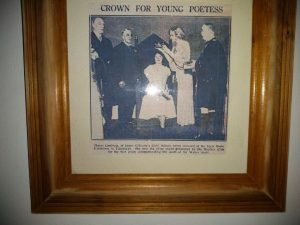 Curran readily admitted that we may never truly understand an artist, particularly one as enigmatic as Spark, and thus the exhibition was designed not to dissect her. Instead, we might be able to reach some glimmer of understanding of the artist through art. Overall, I found the exhibition an intriguing and unpretentious introduction to the world of Muriel Spark. For those already familiar with Spark’s work, I’m sure it will prove an equally engaging and fitting tribute to her life and art.